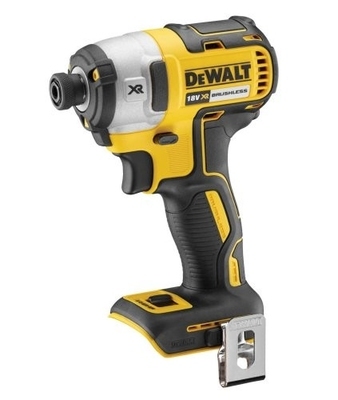 The Dewalt DCF887N impact driver is part of the intelligent XR lithium ion series power tools which are designed for efficiency and making applications faster. It boasts an improved brushless motor which gives a 28% increase in torque, providing excellent power and efficiency in a range of light to heavy applications. The impact driver features integrated 3 mode selector gives a variety of speeds to suit different applications; where mode 1 suits Light and small jobs and mode 3 suits heavy impact jobs. It incorporates a new impact mechanism which provides longer drive and better speed. In addition to this a specialist SBS module derives more power from the motor. A new chuck design with "drop and load" bit holder makes for fast and efficient bit changes and a 3 LED light ring lights up the working area. The DCF887N impact drivers overall length has been reduced to 135mm making it ideal for use in compact and small spaces. Its' light weight and compact design reduces fatigue allowing users to use it for longer periods without rest. The impact driver also includes an ergonomic cold forged impactor handle that improves overall durability.